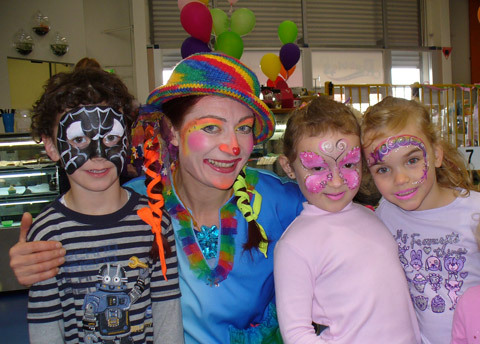 Transform a face through the fantasy of face painting, as you become a living mask of art. Presenting 150 different characters and masks. The approximate time for each make up is 4- 6 minutes per child/adult. The type of material we use is Kryolan water based make up from Germany. With soap and water you can easily clean the face paint off. As experience we have worked in 2 carnivals in Italy (Carnival De Venecia), and a variety of events and festivals in Europe and South Australia. Includes: make up artist and all materials provided. Duration: 1 hr to 3 hrs. Discount applies for the 2nd and 3rd hr. Space requirements: you will need to provide a table and 2 chairs and space to fit them. Recommended for:children’s parties, festivals, fairs and special events. Full body painting art is an amazing and exotic way to promote or launch a product, or useful for shows and fashion parades. Includes: Characters range from, tigers, landscapes, snakes, plant life, marble effects, rainbow, “Miro” art and company logos. The designs can be discussed and coordinated according to the clients’ requirements needed for the event. Duration: 2 to 3 hrs is needed to paint one model. Half body painting 1 to 2 hrs. Space requirements: A room or free space to paint models; if possible with a bathroom. Recommended for: statues, cat walk, promotions/marketing, launches, sales, receiving quests, galleries, festivals and corporate events. Models: The company may provide the required models, or Kaleidoskope can choose the appropriate models to suit the clients taste.